I went to a local Japanese market that carries all kinds of household goods like containers and office supplies and dishes, hoping to find a cute notebook or two to take home. After browsing the stationary aisle, I didn’t really find anything suitable and stumbled over to the beauty aisle. Instead I found a foaming net! I’ve been hearing good things about foaming nets and have been meaning to try one out. I’ve heard that it’s bad to directly apply face wash to the skin and that you should foam it up first. However, it’s difficult to adequately make foam in your own hands, so you can use a foaming net to create lots of thick foam instead. 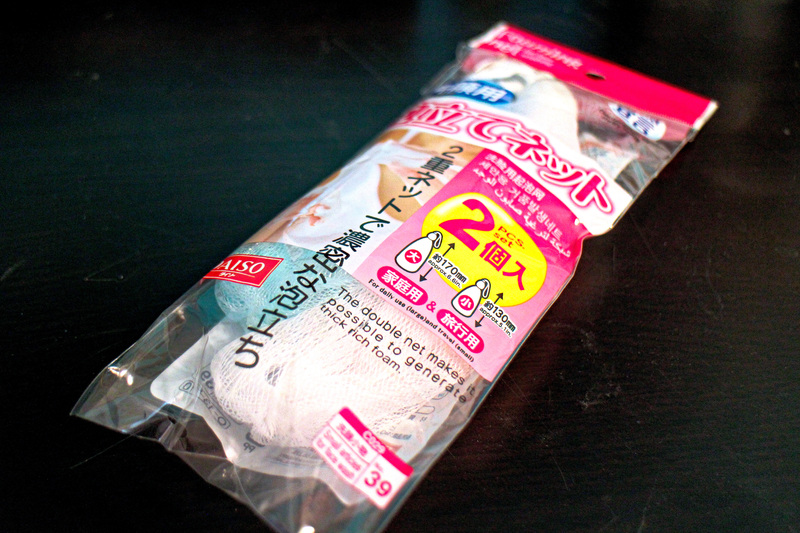 This packet was only $1.50 and comes with two nets, one large size for everyday use, and a small size for traveling. I can’t wait to try them out! 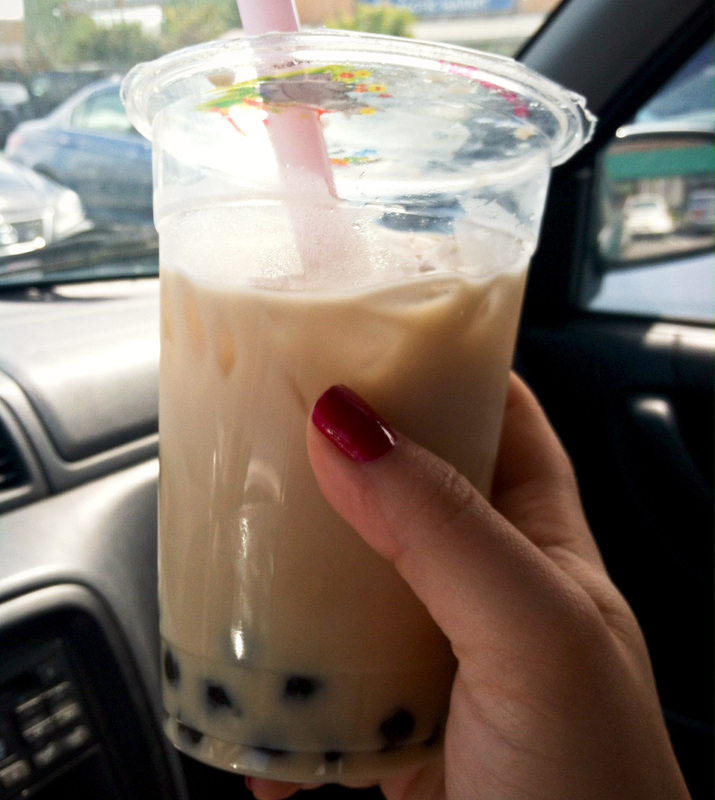 It wasn’t the best bubble tea I’ve ever had (honestly nothing compares to the bubble tea shop that I used to frequent in college) but it was sweet and refreshing. Amazingly, I made one more stop before I made it to Sanrio. 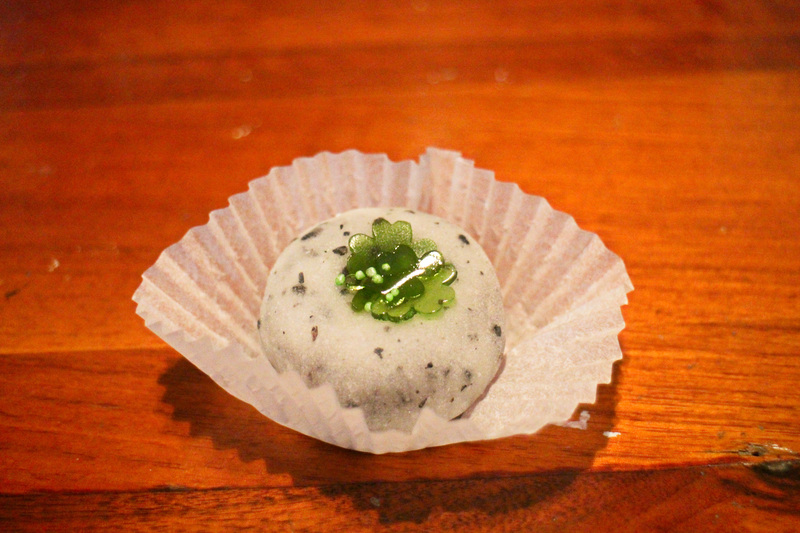 I decided to check out a small mochi shop that was on the way. My favorite mochi shop recently closed so I’ve been on the lookout for a new one. The shop I stopped in makes slightly different kinds of mochi than what I’m used to but I was intrigued by their selection. I asked the lady working there to recommend some mochi to me. I told her I like red bean fillings, so she picked two cute pieces and wrapped them up for me. 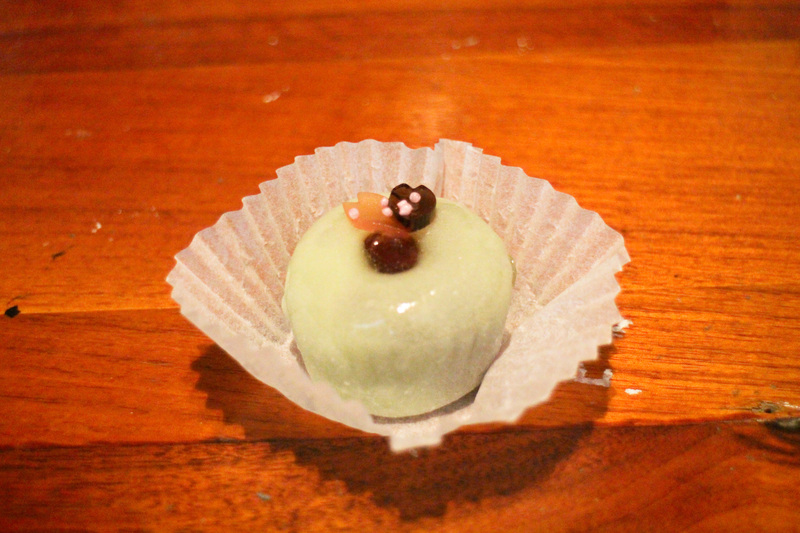 The whitish gray one was topped with shamrock-shaped jellies (for St. Paddy’s Day), which I thought was very cute. 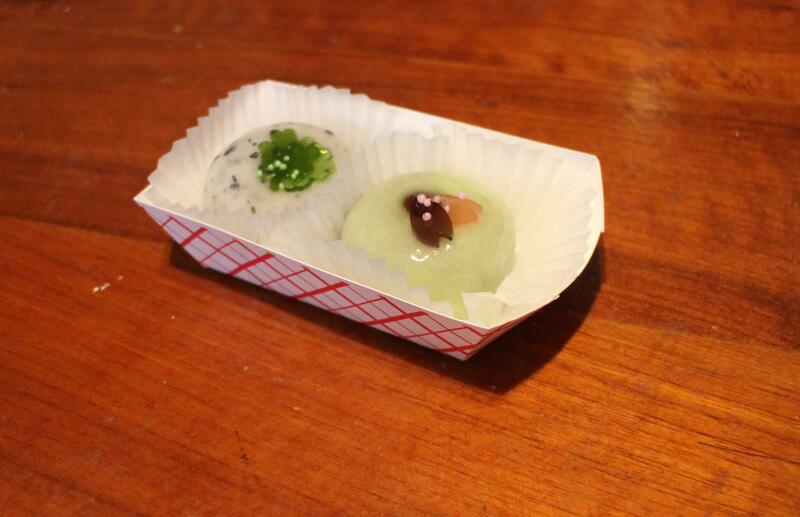 The light green one was topped with a whole red bean and some leaf-shaped jellies, and the skin on this was was glazed over the top, and a bit softer and thinner than the whitish gray one. They were both delicious and I’m really glad I stopped for these. 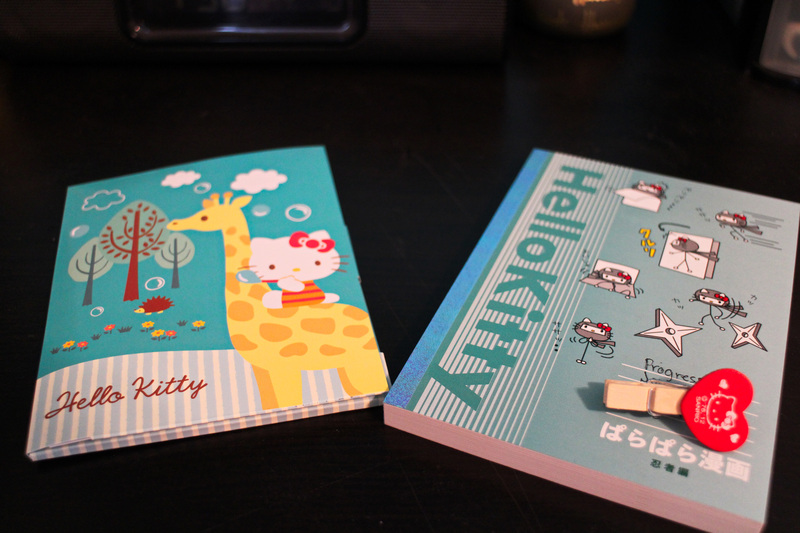 I didn’t think it would be so hard to find cute notebooks! When I was a kid, there was a small stationary shop near my school, and me and my friends would walk there after school to buy cute little notebooks and folders, pens and pencils, pencil cases, and lollipops. There was also a Morning Glory shop nearby, and sometimes my dad would let me shop there for school supplies. Since my hunt for notebooks was unsuccessful, decided to head to the one place I knew would never fail me: the internet! 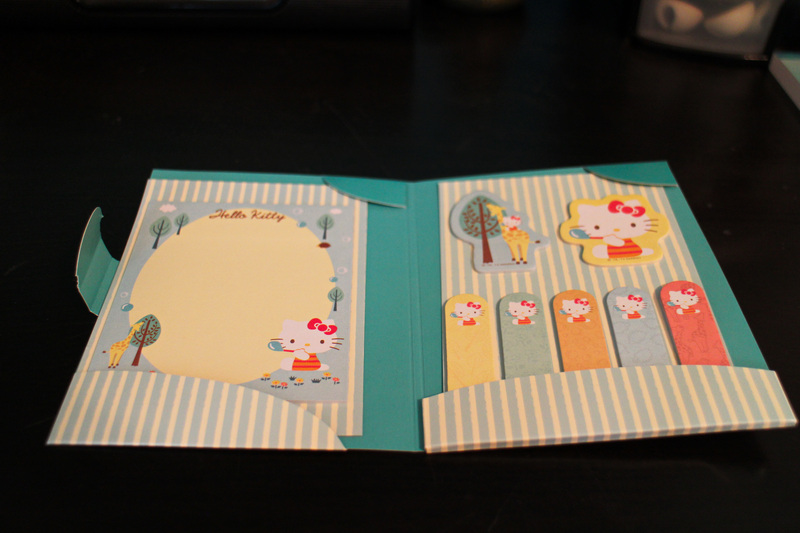 Remembering my childhood, I looked around morninggloryus.com and ended up fining a whole bunch of cute stationary supplies. I ordered 3 different notebooks, along with a new pencil, eraser, and flashcard set and I can’t wait to receive them. I’m feverishly checking the tracking number as I await my delivery. When those goodies arrive, I’ll make another post to show them to you all!